Now that we finally are getting some rain it doesn't seem quite so crazy to have a rain barrel. Up until this week it would have been bone dry. Residents of the Twin Cities take note, you can now buy a rain barrel at a reduced cost through the Recycling Association of Minnesota. All rain barrels must be ordered by July 27th so there are only a few days left to get in on this deal. You can order online. The cost is $65 which is a great deal for these barrels which usually run $115. Rain barrels must be picked up August 14 or 15th in Minnetonka. Why use a rain barrel? Some people push the idea that it is to save money. The barrel is on sale for $65. The water out of the spigot costs $2.91 per unit in Minneapolis, even less in St. Paul. If you use twenty-two and a half units of water from the barrel, it has paid for itself since 22.5 x $2.91 is $65.48! Great right? It seems that way until you consider how much water 23 units is. A unit of water is 748 gallons. That means you have to use 17,204 gallons of water from your rain barrel before it pays for itself. That's a LOT of water. The average sprinkler uses 240 gallons per hour. If you water your lawn once a week you'll use 17,204 gallons in 71 weeks. There are only 20 weeks in the summer so 3.5 years to use that much. In reality, most people aren't watering their lawns with rain barrels, there isn't enough water pressure to run a sprinkler. 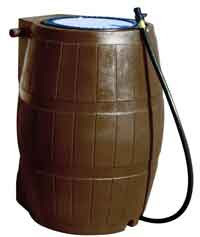 Rain barrels are usually used for incidental watering in the garden. If this is the case, and you're using five gallons here or there it will take longer than the barrel will last to pay it off. Ten gallons a week would take you 86 years to pay off the barrel. There must be another reason to use them and here it is. Rain barrels save water. If many people use rain barrels it avoids water shortages and this is a good thing for the environment. What you need to decide is can you spend a little extra to help the environment?